When one thinks of historic Kazakhstan, a vision of rough-riding, nomadic, gypsy-like people on horseback, traversing a vast, flat, steppe-like landscape, comes to mind. The ancient cultural and artistic achievements of this people might surprise you, however. Their civilization was in fact far from being a cultural desert, as a new exhibit opening in New York City will testify. The Institute for the Study of the Ancient World at New York University (ISAW) will present the first U.S. exhibition with a comprehensive overview of the unique nomadic culture of ancient Kazakhstan. On view from March 7 through June 3, 2012, Nomads and Networks: The Ancient Art and Culture of Kazakhstan focuses on the peoples of the Altai and Tianshan regions (located in the eastern part of the country) from the eighth to first centuries B.C.E. With nearly 250 objects on loan from Kazakhstan's four national museums, the exhibition provides a compelling portrait of nomadic culture, challenging the traditional view of these societies as less developed than their sedentary counterparts. Artifacts on view include bronze openwork offering-stands, superbly decorated with animal and human figures; petroglyphs marking important places in the landscape; and sophisticated gold adornments that marked the social status of those who wore them. A highlight is recently excavated, never-displayed material from a fourth–third century cemetery near the Russian/Chinese border, where permafrost conditions enabled the preservation of organic materials. Included here are such objects as saddles and expertly carved horse trappings that display hybrid mythical animals, among a variety of other artifacts. See the pictorial below for examples of artifacts exhibited. Kazakhstan has been inhabited since the Neolithic Age, and archaeologists believe that humans first domesticated the horse in this region. In fact, before Russian colonization, the Kazakhs had developed a complex culture based on a nomadic pastoral economy, with livestock at the center of their lifestyle. Indeed, in Kazakh society, it was traditional and appropriate that a person ask first about the health of a person's livestock upon greeting and only afterward inquire about the human aspects of their lives, such as family. Horse-riding defined the center of their activities, and to this day, equestrianism and horse-racing is a national passion. 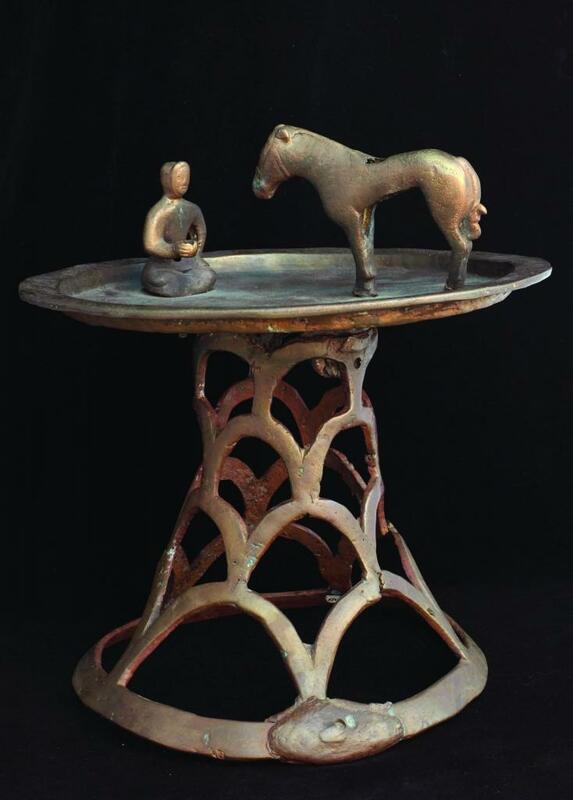 Round Tray on Conical Stand with Figures of Seated Man and Standing Horse in Center. Bronze, 5th - 3rd century B.C.E.. Central State Museum, Alamaty. Courtesy Central State Museum of the Republic of Kazakhstan, Almaty. Belt Terminus with Granulation and Argali Decoration. 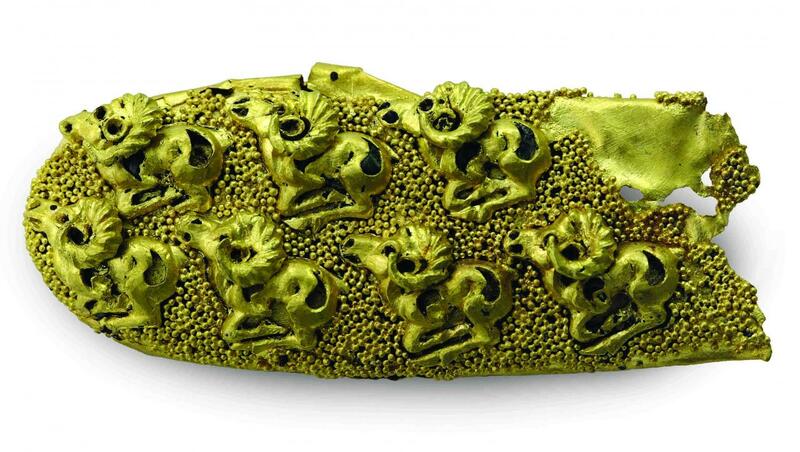 Gold, Zalauli (Kegen District, Almaty Region), 7th - 6th century B.C.E. Central State Museum, Almaty. Courtesy Central State Museum of the Republic of Kazakhstan, Almaty. Diadem, Gold, Turquoise, Carnelian, Coral. 2nd century B.C.E - 1st century C.E. (Wusun) Central State Museum, Almaty. Courtesy Central State Museum of the Republic of Kazakhstan, Almaty. Cauldron Protome of Winged Ibexes. 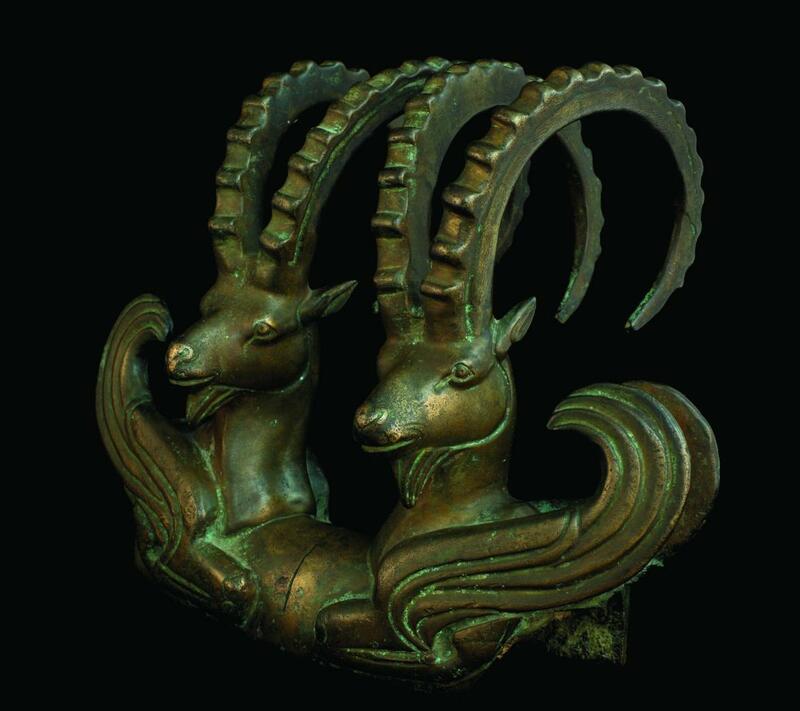 Bronze, Almaty Region, 5th - 3rd century B.C.E. CEntral State Museum, Almaty. Courtesy Central State Museum of the Republic of Kazakhstan, Almaty.